I recently bought a tiny bottle of this, and it immediately reminded me of traveling in India years ago. I also get a huge dose of bubblegum. To me, it works well as a "hippy" scent more than something more formal. The dry down is very soft and cozy, and I agree that it stays close to the skin (I get almost no sillage). I don't think I'll buy it again, but it's been fun to try. I love this scent so much. This is one of those that make strangers come to you asking about your perfume. I wish people would dress up a little more for things that are important. That little bit of discomfort reminds you that the event IS important, and to mind your manners. Happy belated birthday! And what a perfect present! I adore Bal. For me, it's a wonderful comfort scent for cooler weather. French whore, eh? I'm thinking courtesan might not be such a bad thing to add to my resume during this recession if I have to finance my perfume habit. DH has assured me it's fine as long as I get sufficient funds. Very practical minded man. :-) I only have Bal in parfum form. Am wondering if I might actually enjoy layering it w/ the edp. Must check online. Oh, and am so glad you mentioned the originial Scherrer - it's long been one of my faves and doesn't get nearly as much press as it should. Thank you for blogging on Bal. I'm always afraid they're going to kill it off. Wonderful scent, and I wear it when the mood strikes me, even to the market. Suzanne - bubblegum?! Really? I never would have guessed it could come out like that on anyone! Beth, you should write a book, Sounds intriguing indeed...I really love this stuff too! Tom, I thought you might feel that way too. Now, if someone would just get me those opera gloves, I could really go out on the town. Thank you Elle! It was the best present I received by far! it has quickly become one of my go-to scents for cool weather. Don't you just adore the Scherrer? Now I am obsessed with getting some of it for myself after smelling it on someone else. Pity the parfum is discontinued (sob!) but the EDT is plenty strong. I'm just catching up on my reading, but I wanted to say this is a great review of a beautiful classic. I have a bottle of the parfum, purchased 7 or 8 years ago. 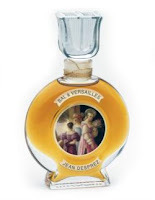 It came with a pamphlet stating that they had used the original formula of Jean Desprez, which had been held for a decade by the perfumers at Robertet in France. No mention of the civet that many people talk about. I've loved and worn Bal for years and years. I wear it to sleep and, um, to not sleep. Wrote my first blog entry about it, too. When you want to feel lush, like a full-on woman in silk and brocade, there's nothing like it. Oh, and I just bought a pair of velvet opera-length black gloves, too! Don't know where I'll wear them...but who cares. Sometimes you just gotta go against the flow.